was a French military and political leader who rose to prominence during the latter stages of the French Revolution and its associated wars in Europe. Napoleon's Empire. Napoleon was a masterful ruler. He established a number of reforms that brought peace and stability back to France. 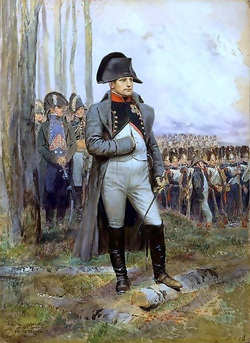 Napoleon—benefiting perhaps by the new belief in equality after the French Revolution—rose very quickly from obscurity to brigadier general to become commander of the Army of Italy. He took over France, and proclaimed himself emperor in 1804. For the next eight years his armies marched through Europe, from Portugal in the west and as far as the Russian border in the east. But after a disastrous attack on Moscow, which cost hundreds of thousands of lives, Napoleon was forced to abdicate in 1814 and was exiled to the island of Elba, just off the coast of Tuscany. Napoleon arrived on Elba on May 4, 1814, as “Emperor and Ruler of Elba,” a position he appears to have taken quite seriously. Once on the island, he began making improvements. He built a residence for himself out of a mill; reformed the government; and improved the roads, bridges, iron mines, and harbors. In 1815 Napoleon left the island to reclaim his throne with 700 men, a million francs, four guns, three generals, and a supply of ammunition. When he reached the town of Laffrey, he was blocked by an infantry battalion. According to accounts of the time, he approached the opposing infantry, alone and unarmed, and shouted, “It is I, Napoleon. Kill your emperor if you wish.” There was silence, and then a shout of “Vive l’Empreur!” Many of the soldiers abandoned their posts and joined him. After his opponents in Paris fled, Napoleon returned to the city for his coronation. Although he returned triumphantly, the French people never fully embraced him a second time, and European powers moved quickly to crush him. Defeated at Waterloo in June 1815, Napoleon abdicated soon after. The British sent him to St. Helena, where he spent the last six years of his life in a more distant and restrictive exile than he had experienced on Elba. To understand the political, economic and social impact of Napoleon in Europe and the world. To be able to explain how Napoleon uses nationalism as a means of expanding his influence and how resistance to Napoleon helped to spread the ideal of nationalism. bring the lessons alive with these creative activities. Color in the city of Paris while listening to audio books on your topic of choice. Explore the online Met exhibits in fashion for this time period from around the globe. your own miniature city of Paris! Learn about fashion and style. Looking for more free printable resources for your Napoleon Unit Study. Please head over to DIY Homeschooler! We also found a free Napoleon Notebooking page for you to record your new knowledge at BrightIdeasPress.